Students in Jacqui Lewis’ abnormal psychology class are not listening to her. They’re too busy checking their cellphones. And that’s fine with her. Over in the auditorium, no one is at the podium. Hundreds of students’ voices nearly drown out advanced biology instructor Matthew Mahavongtrakul, standing in the back talking to a few of them. It’s all part of the lesson plan. 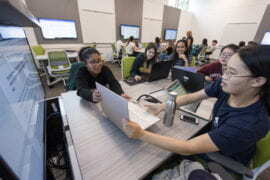 Clustered in “smart” classrooms in UCI’s new Anteater Learning Pavilion and across campus, students are increasingly using sophisticated technology and each other to learn. Online readings are paired with in-class discussion and exercises. It’s called active learning – nationally recognized, research-proven – and it’s flipping traditional teaching on its head. Broadly defined, active learning is anything that requires students to participate, rather than passively taking notes and employing rote memorization for exams. In groups of six to eight, they huddle over assignment questions on their laptops; check their phones for highly cited research papers, famous paintings or history archives; and, most importantly, talk each other through to solutions. Their answers are displayed on multiple screens to the whole class for further feedback. Extensive research has shown that engaging students in structured teamwork helps them retain knowledge, earn better grades and gain collaborative skills that employers prize. 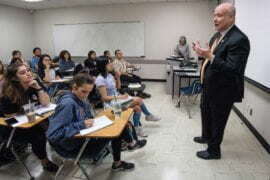 “In order for our students to be prepared for a complicated, competitive world, they have to be ready to understand processes, analyze arguments and apply what they’ve learned to real-world situations,” says Michael Dennin, vice provost for teaching and learning and dean of the Division of Undergraduate Education. 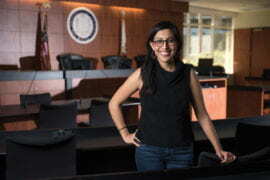 UCI is a proven leader in cutting-edge teaching and learning strategies. More than a decade ago, pioneering work by the Division of Continuing Education created some of the original widely available online courses. The university was also the first to equip all medical students with iPads and reinvent the curriculum for today’s healthcare via the iMedEd Initiative. 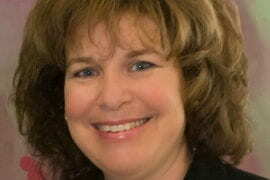 Today, a national pilot program by the School of Education aims to use real-time analytics to track study habits. 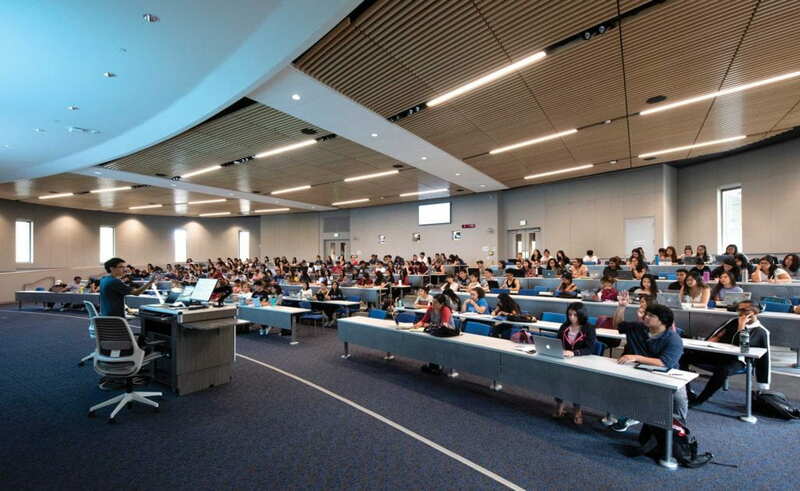 A centerpiece of the undergraduate division’s efforts is the 65,000-square-foot Anteater Learning Pavilion, adding much-needed classroom space to the fast-growing campus. 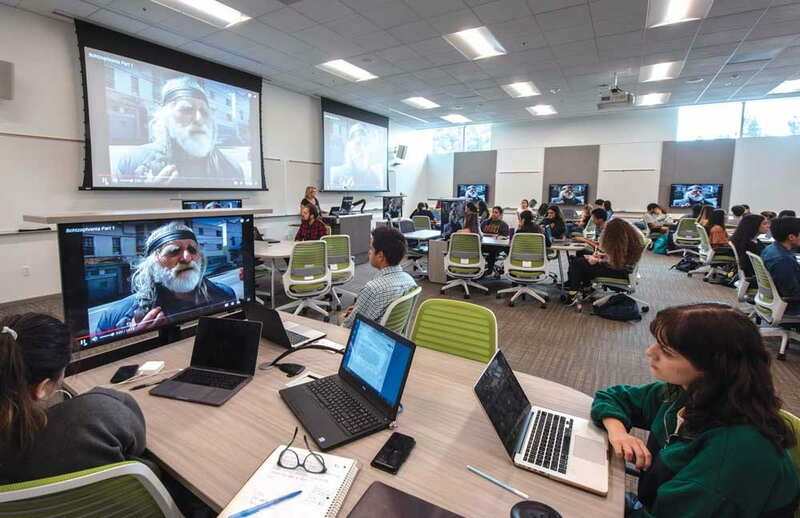 It’s the first building in California completely dedicated to active learning – and only the second in the country, after Oregon State University’s – and it’s wired for 21st-century education. The structure was designed from the ground up to support increased interaction. In 15 classrooms and two auditoriums, every seat either swivels 360 degrees or rolls easily. Old-school audiovisual equipment has been replaced by sleek computer screens on all four walls and at each group desk – all linking wirelessly to laptop or mobile devices. But it’s not just about the technology; it’s about students using it. In American history courses, they seek out slave records on the internet or create an online 1800s frontier town. In neurobiology, they match illness symptoms to disease diagnoses and research treatments. And in science communications, they calculate how many elephants it would take to raise sea levels, compared with glacier melt. 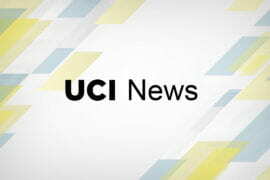 A hallmark of UCI’s active learning is that it spans every discipline. While the concept largely began in Stanford University’s chemistry department and has been picked up by science educators across the U.S., classes here range from dance to public health to mathematics. Most students say they like the new techniques, once they realize that there’s a structure to the exercises and that they could earn better grades. “It keeps you concentrating, rather than listening to a professor up front, so it stays in your mind longer,” says Ayushi Kamdar, a fourth-year business administration and psychology major. “I like it. I’ve just had to get used to it,” adds Akif Khan, a third-year cognitive sciences major. 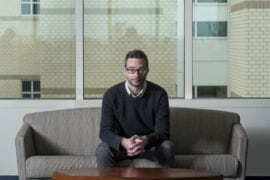 He and others in Lewis’ abnormal psychology course were among the first to try out the new space. They say it’s easier to see information on pop-up monitors on tables at eye level than high on a screen at the front of the room – and simpler to conduct online searches. Working through knotty problems with classmates is also gratifying. “You feel immediate affirmation, and you can come together and find answers as a group,” Khan says. In addition, teachers can gather immediate feedback on how well the class is comprehending the material. Research shows that students better retain information they associate with a test. But a traditional instructor often doesn’t know whether lessons are sinking in until final exams are taken. “I could look out and they’d all be nodding their heads, but I had no idea if they were really grasping what I was saying,” Bower says, laughing, of how he used to teach. But in active learning classrooms, quick quizzes allow faculty to gauge on the spot how well key concepts are understood, then immediately retool instruction as necessary. The mini-tests are geared to today’s tech-savvy students. Rounds of “Jeopardy!”-like questions might be projected on a screen, with groups competing to answer the fastest via smartphone, iClicker or tablet. Aggregated results are instantly visible. Or scratch-off lottery-style tickets might give teams a star when they reveal the right answer – the fewer the tries, the more points earned. Rewards can range from a bag of candies to a percentage point toward final grades. Students also receive bonus coupons for attendance, participation and tackling tough subjects. “They absolutely love it,” Bower says. Quizzes are often given about two-thirds of the way through class, when attention spans may be flagging – similar to the seventh-inning stretch at a baseball game. Not all students are thrilled with collaborative learning. Some complain that they do more work than their classmates and fear that their grades will suffer if they’re tied to a group’s performance. Dennin’s reply is that while they have been educated since kindergarten to excel as individuals, in college they need to learn how to cooperate. Khan expresses another common fear: that he might not get as much one-on-one time with his instructors. Faculty, however, say the opposite is true. In a school of 30,000-plus students, active learning affords more direct interaction, with the professor and teaching assistants roaming the classroom to hear students’ questions and ideas and offer feedback. In large introductory classes, stellar undergraduates who’ve already aced the course – known as “learning assistants” – also help out. (They receive credits or are paid for the work.) Instructors and assistants bring unique strengths. The professor is the voice of authority, but nervous undergrads may feel more comfortable asking a question of someone closer to their age. 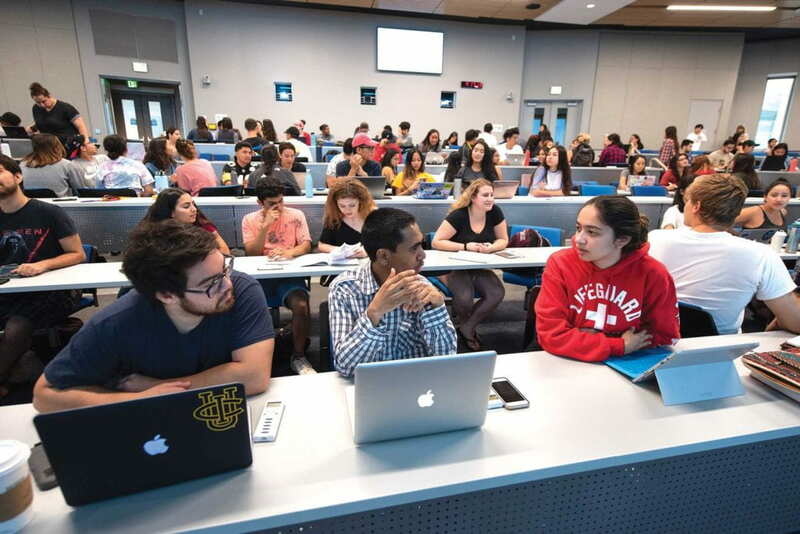 Research by UCI faculty and others has shown that active learning improves student performance, not just in one class but for life. 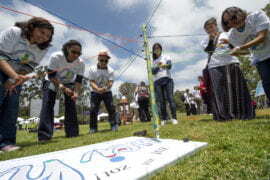 It helps them retain knowledge longer, earn better grades and become critical thinkers. 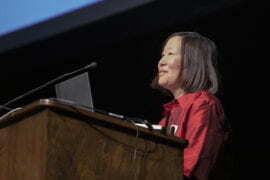 A 2014 Proceedings of the National Academy of Sciences review of more than 200 studies found that students in traditional lecture-style science and engineering courses were 1.5 times more likely to fail than those in active learning classes, and those in the latter received, on average, 6 percent higher grades. The approach can be particularly helpful for underrepresented minorities and other bright students with gaps in their formal education. A 2016 study by UCI and UCLA concluded that while most students earned slightly better grades when collaborative learning was employed, first-generation students showed the greatest and longest-lasting gains. Gina Ruggiero teaches English to second language learners, many of whom, she says, weren’t taught to communicate effectively in high school. Her antidote? She has the students interview each other, like journalists, and videotapes their performances so they can see for themselves how they’ve done. Ultimately, the main goal isn’t to fight boredom or have students use the latest bells and whistles; it’s to teach them to learn for themselves. In psychology lecturer Lewis’ inaugural class at the Anteater Learning Pavilion in September, the subject of the day was schizophrenia – symptoms, societal attitudes and treatments. She spoke briefly, and then she and Bower, her TA, had the students find examples of what might be considered stereotypical portrayals of people with schizophrenia. An oil painting of a woman in agony, photos of homeless people and a cartoon of a person with voices coming out of his head flashed on the monitors. Next up, with the push of a button, Lewis showed sometimes harrowing YouTube and health clinic videos of such patients struggling through conversations with doctors. She also played an interview with a highly successful individual with schizophrenia who’d triumphed over the disease with medication and psychoanalysis. At the end of class, Lewis and Bower had teams hunt for the latest research on treatments. They offered clue phrases for online searches, but it was up to the groups to locate the primary materials – just as they would need to do in academic or counseling careers. Kamdar, Khan and the rest of their cluster scanned peer-reviewed papers online. One that looked promising was a decade old and probably out of date. With the clock ticking, they hit on something: a study on a new virtual reality therapy that enables people with schizophrenia to quell hallucinations by assigning avatars to handle them. Lewis beamed. The students had unearthed research so cutting-edge that it wasn’t yet in any textbook. The class then explored how this new therapy grew out of more traditional techniques, which led seamlessly to a discussion of topics that would be on the final exam. Originally published in the Winter 2019 issue of UCI Magazine.